Gateway Select is an innovative talent pathway for those seeking to become pilots at JetBlue. 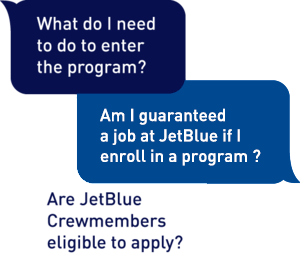 This particular Gateway Program will allow an applicant, if successful, to learn with us from the beginning and become a JetBlue pilot after completing a rigorous training program. This unique, accessible and cost effective JetBlue Pilot Gateway Program will take a more competency-based approach to becoming a professional pilot. The Program will optimize the training of prospective airline pilots by offering early exposure to multi-crew/multi-engine operations, full motion simulator training, crew resource management, and threat and error management. Once meeting all program requirements, including the FAA's 1,500 flight-hour requirement, pilots will become a new hire at JetBlue. At that time, graduates will go through the same orientation and six-week instruction that all first officers complete. Must be 23 years old by the completion of the approximate 3.5-year program. Must be able to obtain and maintain a First-Class Medical Certificate. Must be able to obtain a valid passport with the ability to travel in and out of the United States by the end of training. Must be able to demonstrate proficiency in reading, writing, and speaking English. If accepted into the program, students follow a multi-phase training sequence over the course of three-four years. Gateway Select has been designed to bring more predictability and a lower overall cost to aspiring pilots. The cost of Gateway Select is approximately $110,000, payable in installments over the course of roughly 12 months. We have two options for financial assistance to help alleviate monetary barriers to this program: Wells Fargo and US Credit, Inc.. Both lenders are able to provide financing for the full amount of the program costs, depending on eligibility. To see if you qualify for Wells Fargo financing, please apply via this link. To see if you qualify for US Credit, Inc. financing, please visit this link. Submit an application during the designated period. If you are selected to move forward, you will receive an invitation to take an assessment. The assessment fee is $160 and covers the cost of the administration of the assessment and processing fees for the testing facility. This fee is non-refundable if the assessment is taken, or 48 hours cancellation notice is not given to the testing facility. Take the online assessment at one of the nation-wide testing facilities. International testing is not available for this program. If you are selected to move forward based on your assessment results, you will be invited to meet with the JetBlue team for a series of interviews, then further testing.